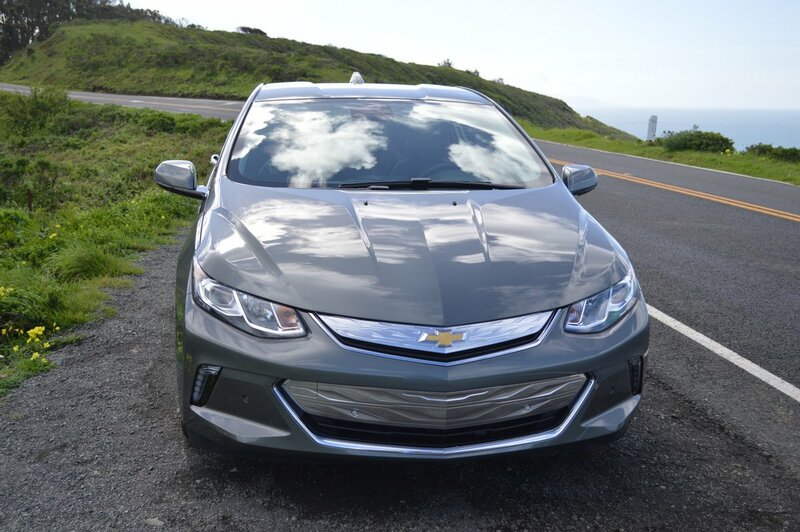 The completely revised 2016 Volt is a triumph of engineering for the Chevrolet Division of GM. In every way, Volt 2.0 is better than the original. This improvement is all the more impressive since Volt 1.0 was a very fine tool indeed. 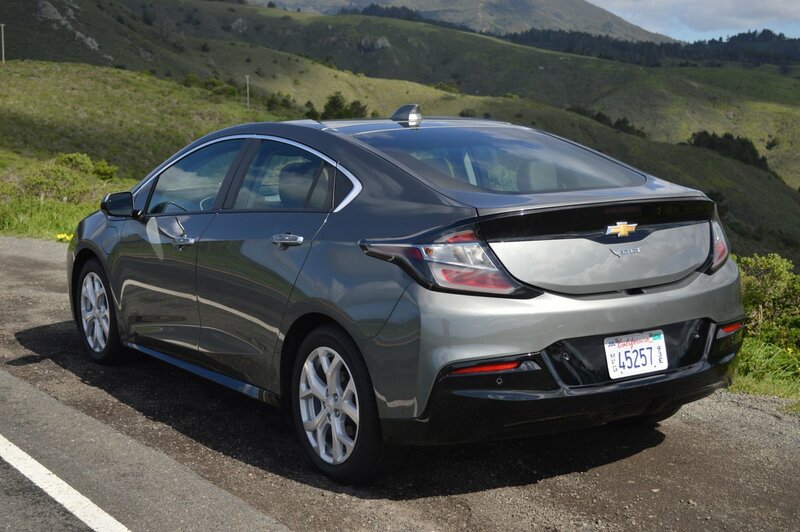 What’s most attractive about the 2016 Volt is its complete assimilation into the driving mainstream. Unlike the first iteration, the 2016 version has lost the need to proclaim how different and revolutionary it is. 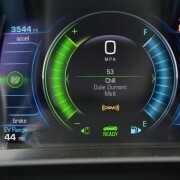 Gone is the annoying Chiclet-style dashboard surface of Volt 1.0. Gone too are the first offering’s corny Jetson styling touches. And best of all, the 38 mile electric travel range of Volt 1.0 has been superceded by a genuine, dependable 53 mile range which we proved in repeated usage. 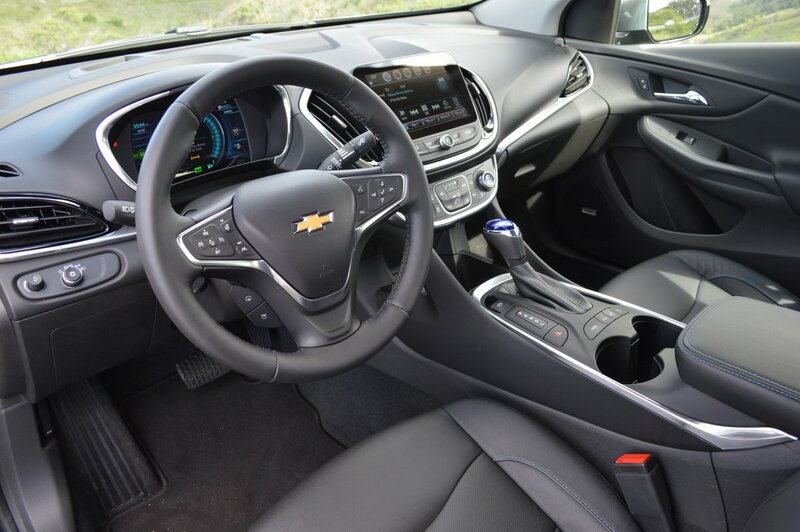 At first glance, the interior of the new Volt looks rather subdued, especially for such a ground breaking piece of equipment. 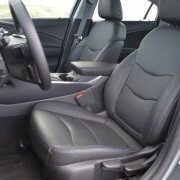 The semi-gloss “Jet Black” cloth upholstery looks almost funereal, save for some counterpoint blue stitching around the edges. 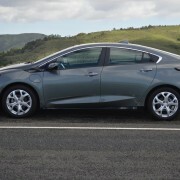 The exterior of the compact sedan hardly screams “I Sing The Car Electric.” With the exception of some matte aluminum tin foil burnishing the front grill bars, this new Volt could easily be mistaken for a two-year old Toyota Corolla. 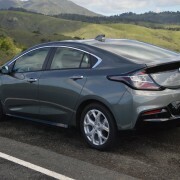 Maybe it was the muted tonality of its “Heather Gray Metallic” exterior shade, but our Volt tended to get lost in a sea of small sedans wherever we parked it. 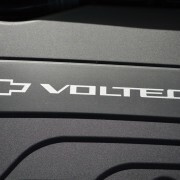 That anonymity happens to be just what I liked about Volt 2.0. 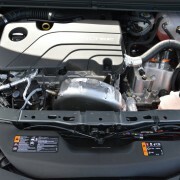 Since inception, revolutionary electric cars like the Volt, and especially the Prius, have found it necessary to scream about their world saving power source at top stylistic decibel. The Prius has always been most annoying in this respect, with its silly vent windows, goofy instrument graphics, and kindergarten control stalks. 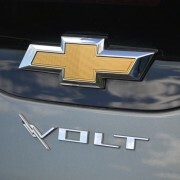 The first Volt was also complicit in this regard, with faux alligator upholstery and over-the-top styling aimed at declaring its revolutionary altruism. 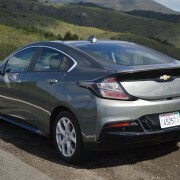 Chevy has really detuned all that bombastic noise, and the new Volt is ready to stand on its own as an engineering masterpiece rather than a styling exercise. 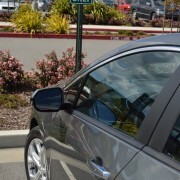 In our week with Volt, we used exactly 1 gallon of gas! Only once did our normal daily commute involve a trip longer than 53 miles. 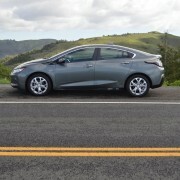 At that point, the Volt cut seamlessly over to its 1.5 liter gasoline fueled engine for the 53 mile return voyage. 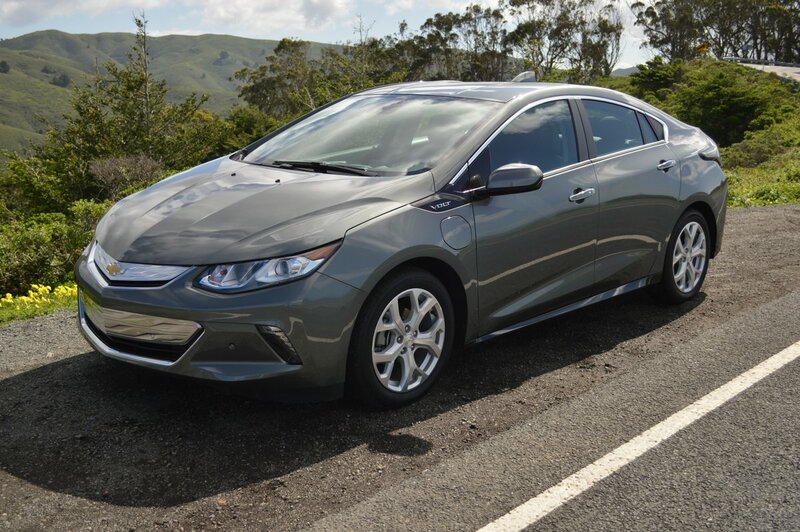 By EPA estimates, the Volt’s “Range Extender” gas motor gets 42 MPG in combined city/highway driving, using 2.4 gallons for 100 miles of travel. In pure electric form, it returns 106 MPGe. 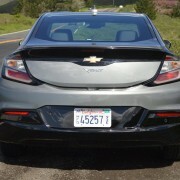 Now we religiously recharged the Volt overnight every day. 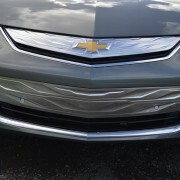 This is especially easy to accomplish since Chevy provides a recharge unit which stores neatly out of the way in a side compartment of the trunk. This recharger weighs about half what the same unit did in an Audi A3 e-tron we recently tested. It plugs into 120V household current and will recharge the Volt fully in about 14 hours, i.e. overnight. 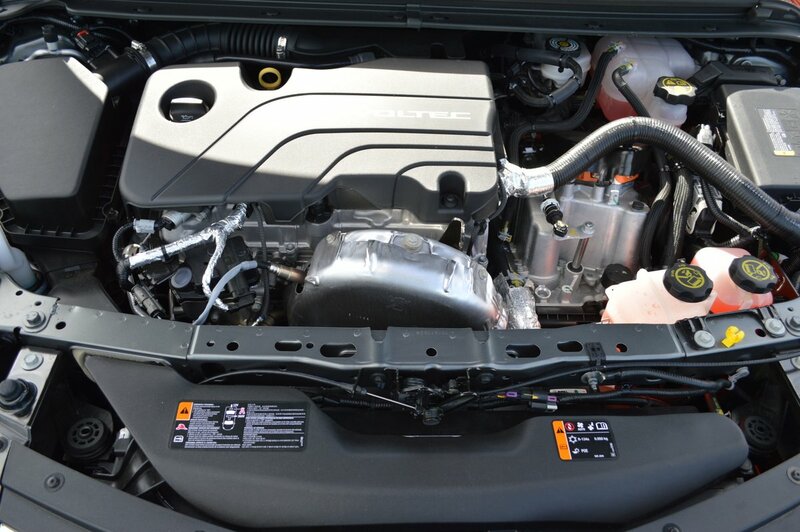 If you opt for the 240V recharge system, a full charge on a depleted battery takes just 4.5 hours. 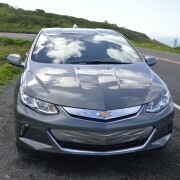 In other words, living with Volt on a gasoline free basis is very much a reality if your daily drive is under 53 miles. 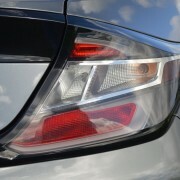 By every other metric of performance, the new Volt exceeds expectations. 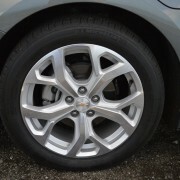 First and foremost, it handles really well since Chevy reduced its battery weight and curb weight. 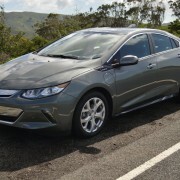 The Volt has lost 200 pounds, and now weighs just 3,543 pounds. 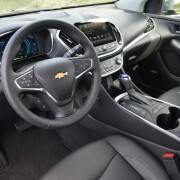 Since Chevy added a new two-motor drive unit that is 12 % more efficient than before, the 0-30 mph acceleration is much quicker and overall performance verges on scintillating. 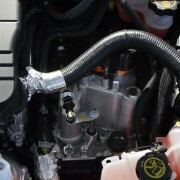 Look to the torque figure of 294 lb.-ft. and you will see a thrust output unequalled by small sedans in this price range. 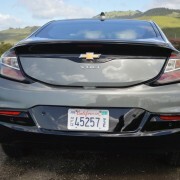 Although the Volt utilizes relatively hard, small footprint tires in order to improve mileage figures, the car is so well-balanced that it will scoot through turns quicker than its Michelin Energy saver tires (215/50R17) would have you think possible. The only downside is they do tend to squeal when pushed hard. Chevy has done wonders with a suspension that uses a rear torsion beam axle and is not fully independent. The Volt hardly ever leans excessively in tight turns, and the overall ride quality provided by the torsion beam’s hydraulic bushings is excellent. 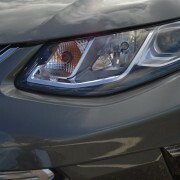 Volt 2.0 is a winner in every regard. The hatchback configuration meant we could easily slide a couple of 4 foot long boxes containing metal shelves through the trunk and into the passenger compartment, after dropping just the 40% side of the 60/40 folding rear seat. 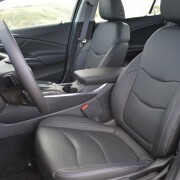 While rear seating is tight, the Volt suffices as a usable 4 seater for adults, and the trunk area is plenty large without resorting to folded rear seats. 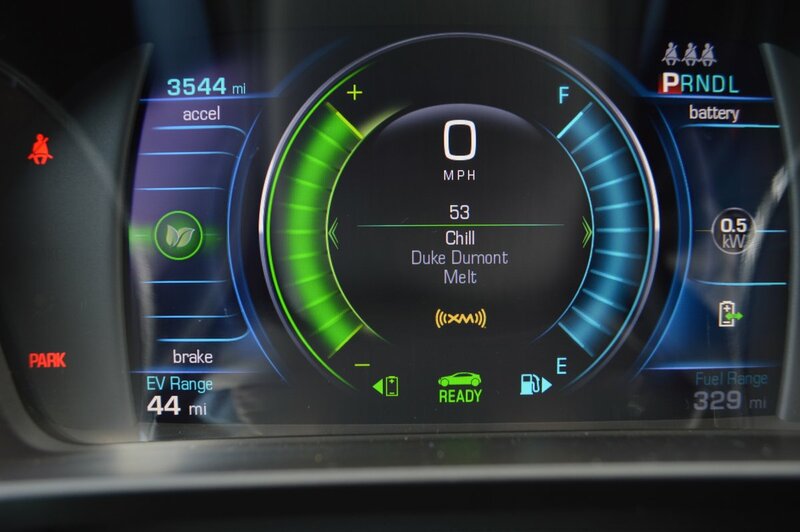 If the parameters of the Volt’s range meet your needs you can forget about regular trips to the gas station from now on.